"A Fresh Start to Fresh Starts"
Ever since word about Mass Effect: Andromeda got out, I remembered the Mass Effect 3 ending. I know I wasn't alone in this thinking. The resulting fallout from that game brought an ugly end to the franchise that lasted for five years until Andromeda's release. From the beginning, I knew the reception for Andromeda would be judged in light of its predecessors. Though skeptical opinion abounded, and perhaps unfairly, Andromeda's success hinged on its ability to address a jaded audience. BioWare and Electronic Arts demonstrated a clear knowledge of this as well, and explicitly distanced themselves from the Shepard arc with this new game. Every now and then I encountered a few humorous call-backs, but for the most part Andromeda tries to emphasize new beginnings. It's clear to both to the developers and the audience that Andromeda hopes to serve as a fresh start to the franchise. I want to bridge much of the divisiveness that still remains prevalent between other reviews, and address strengths as well as player concerns. Despite many setbacks, like much of what unfolds over the game, Andromeda succeeded in much of what it set out to do. In terms of gameplay and story, BioWare achieved an effective blend of old and new elements to their franchise. Though the game suffers from notable (and sometimes game-breaking) bugs, gameplay enjoys solid improvement over its predecessors. 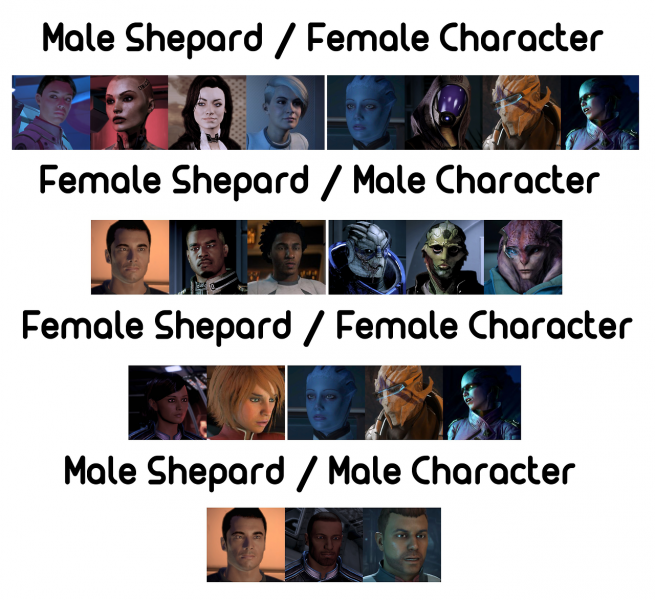 In terms of their reputation as a progressive company, BioWare continues to struggle with representing people of all genders and orientation, but has demonstrated an awareness of the sensitive nature of colonialism and race. Much of my initial fears and assumptions of the plot proved unfounded, and my pleasant surprise helps me concede my cautiousness in key areas. Several design improvements step Andromeda in the right direction. Combat mechanics enjoy a fluid cover system compared to its predecessors. Players no longer stick to walls like glue, and jump jets allow for vertical flanks to factor into battles. Additionally, the enemy AI enjoys notable improvements in their tactics to flush out players. 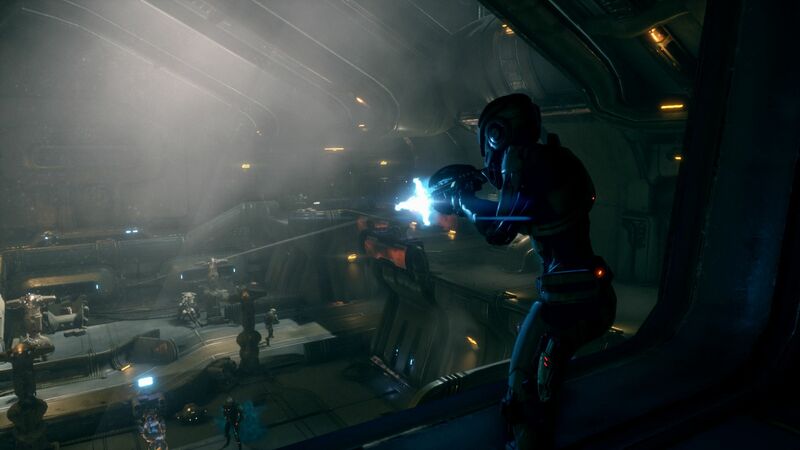 This forces Mass Effect veterans to move from cover to cover, and prevents Andromeda from becoming another corridor shooter. [caption id="" align="alignnone" width="1920"] It's over, Archon! Ryder has the high ground! [/caption] Weapon and Armor levels from the first Mass Effect make a reprisal in Andromeda. In addition, players research and develop new arms and armor for their player to use. Through mods and augmentation slots, players can alter the fundamental properties of their firearms to suit their playstyle, and equip consumables that give them an additional advantage in tough battles. Another key design change comes with player powers. No longer restricted to classes with a set of powers, players are free to mix and match their abilities from all types to suit their preference. Nevertheless, dedication towards a single class yield perks as beneficial as players that put points in others. BioWare crafted a class system that uniquely rewards all play styles, and this remains Andromeda's greatest strength. I wish I could talk about the multiplayer more. As it stands right now, the multiplayer element to Andromeda suffers from repeated connection issues. Often, I would not be able to complete a match due to dropped players and hosts, and private matchmaking with friends cannot migrate to a public server if so desired. Functionally, the gameplay is virtually identical to Mass Effect 3's multiplayer, but lasts for fewer waves. To compensate, the difficulty, coupled with the shifts in gameplay, becomes much more pronounced. The chances for survival in multiplayer, especially when starting out, remain slim until the player acclimates to new strategies. Many prospective players might find the transition frustrating. In terms of level design, Andromeda specifically pursued a return to open worlds. With navigation and exploration systems similar to the first Mass Effect game, Andromeda features sprawling worlds with diverse terrain, ecosystems, and environments. Andromeda improved Mass Effect's initial model by adding flora and fauna, and brought life and hazard to new levels of immersion. Each planet comes with a plethora of missions and assignments, as well as fast travel points unlocked through exploration. Players travel either in the Nomad or on foot, and rarely lack for tasks to complete. With such vast environments, the Mako's replacement, the Nomad, fulfilled all the player's long-distance needs. Though unarmed, the Nomad functioned and acted much like its inspiration; properly upgraded, it could scale sheer cliffs and roam around worlds of all shapes and sizes. Though not without its learning curves, the Nomad quickly grew on me as a return to Mass Effect's appeal: exploration. I noticed that the open world design came into conflict with Andromeda's linear storytelling, however. 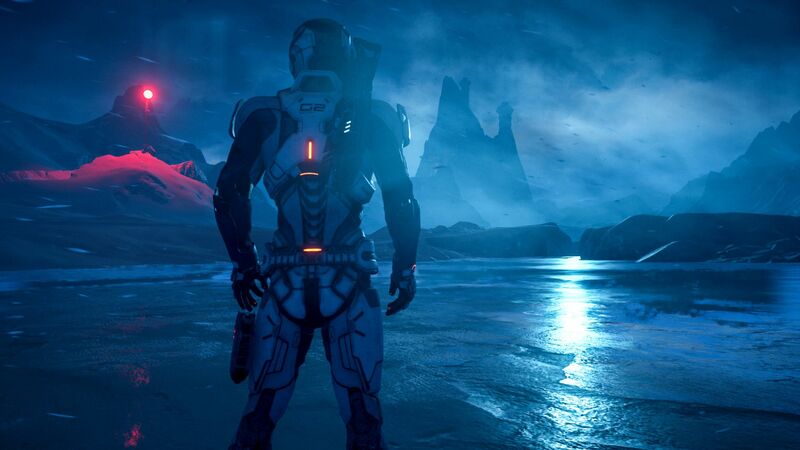 Many of the quests in Andromeda followed a specific sequence of locations Ryder must visit. This, combined with the vast setting, led to an irritating amount of backtracking. Prior exploration may cover areas designed to be discovered later in the game, but this is never made explicit. Completionists with a penchant to deal with every side quest before embarking on main missions will also have to make repeat visits to key worlds. Aesthetically, Mass Effect: Andromeda comes with a checkered mix of strengths and shortcomings. These hinge mostly around the use of the Frostbite 3 game engine, previously used in BioWare's latest Dragon Age installment. Originally developed by Electronic Arts for its Battlefield series, the engine brings virtually unparalleled realism to lighting and weather effects. Andromeda's developers highlighted Frostbite's physics-based rendering system as both a challenge and a feature for the game's artistic vision. In practice, it results in great immersion to interstellar exploration, but it demands much from computer hardware. The difficulty that BioWare experienced with this engine is easily apparent; Mass Effect: Andromeda is not a polished product. Many of the bugs draw parallels more to a Bethesda product than one by Electronic Arts. A common complaint players gave about the animations came from the characters themselves; though expressive in the jaw and mouth, many characters did not seem to express much emotion with their brows or upper face. This resulted in the dialogue feeling stilted. More sparse, but jarring bugs included bad camera placement, awkward character animations, and unspoken dialogue. For all of its stunning visual quality, Frostbite requires intense troubleshooting before being implemented in a game. In addition, Andromeda suffered a serious blow to the franchise's reputation as a role-playing game. Character customization suffered extensively not only from the constraints of the Frostbite engine, but also because of the game design. 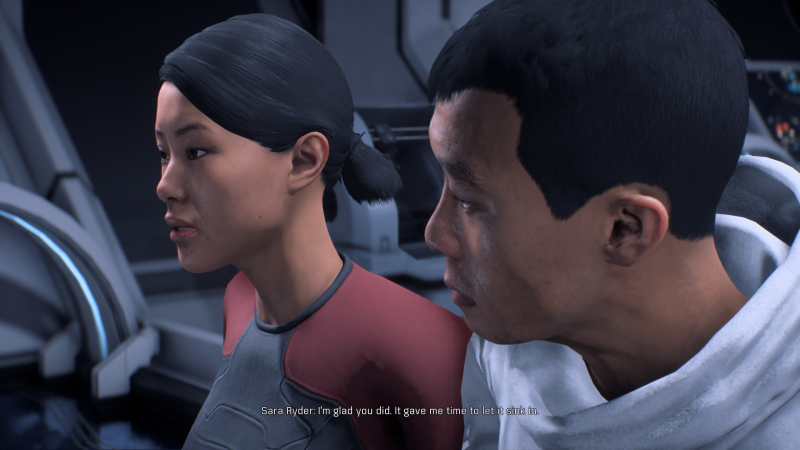 Ryder's family, especially the father figure, feature prominently in the game. His appearance is based entirely off of the player's choice in character design, which tied player programming with NPC appearance. With additional programming considerations in mind, the limitations in the character creator are understandable. Complaints also abounded in terms of the limited selection of powers. Far from a lack of options, many players expressed discontent with being able to use only three powers at a time. Andromeda addresses this issue through the use of customized power and class profiles; up to four could be saved at a time. However, because past games restricted powers along the class line, veteran players often min/maxed down a particular class tree, rather than diversified. These shifts in gameplay required players to abandon what they knew in favor of flexibility. The player's companions, similarly, lacked for customization. Lacking alternate outfits, and even weapon loadout, players were restricted to investing points into their abilities. In combat, the player can longer even control when their companions use their abilities. To make up for this, companion abilities can be upgraded to become primers or detonators for combos. In this way, the player can optimize their powers to sync well with their favored companions. As far as narrative design goes, Mass Effect: Andromeda weaved together a fantastic narrative that addressed the two cornerstones of gameplay; combat and exploration. Throughout these two concepts, the writers also weaved in concepts of family, identity, and community in a frontier setting. 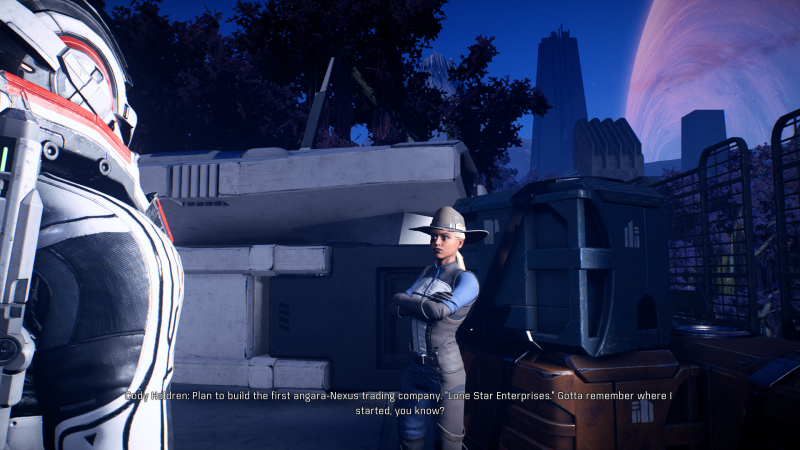 [caption id="attachment_94876" align="alignnone" width="800"] Meet the most American colonist in Andromeda! [/caption] The player experiences the story as one of the Ryder siblings, as their family embarks as a journey to the Milky Way galaxy's neighbor, the Andromeda galaxy. Shortly after arrival, any semblance of a plan quickly goes south as the players and all the colonists scramble to overcome unknown dangers and discover a mysterious, but young past in the Heleus cluster. The Andromeda Initiative, as quickly established in the beginning, serves as a civilian venture for discovery and pioneering. In gameplay this manifests in planetary exploration and discovering the ancient vaults of the Remnant, an enigmatic race responsible for devices capable of terraforming planets into life-supporting worlds. Equally prevalent in the plot are the Kett, a race bent on conquering and assimilation of all life. The most common foe in the game, players often engage Kett soldiers in combat, and early settlers find themselves defending their homes and lives against them, in addition to raiders and other hostile natives to the Andromeda galaxy. As foreigners in a strange land, the ties that bind become tested in the fires of conflict. Is Surviving The Same as Living? Despite its pitfalls, however, I believe Mass Effect: Andromeda, at the very least, shows BioWare's commitment to innovation and excellence in the video game industry. Mass Effect is many things to many people, and it enjoys a plethora of selling points that range from exploration to combat to romance. Depending on a player's preferences and priorities, Mass Effect: Andromeda will either be seen as the game that revived the franchise, or the final nail in its coffin. At the very least, I can say with some confidence that Mass Effect: Andromeda nailed its ending. It captured most of the feeling it set out to establish, and the epilogue hints at further developments to follow. I left with a sense of satisfaction, anticipation, and a greater degree of optimism for what BioWare has in store for players next. And so, finally, I try to gather my thoughts on this vast game. At 45 gigabytes worth of content and 85 hours of experience under my belt, I find it difficult to quantify the qualities and shortcomings of this game with a number. With so much content that requires a hefty investment of one's time, I believe any other review that reduces the game to glitchy mechanics and aesthetics, or to exclusively praise its best qualities, leave out crucial parts of what makes Andromeda an 8/10 game. I believe the shortcomings of the game remain clearly apparent; but to me these pitfalls are details that do not fundamentally detract from the overall picture. When viewed in an objective context (and without the pessimism from past failures), I think Andromeda serves as a start. In a way, the game's plot and its reception to a mixed crowd bear many similarities. It by no means shows any sort of crowning achievement for BioWare, but Mass Effect: Andromeda lays a promising foundation of progress that the company can develop further to make a more polished, superior sequel. I look forward to see what the Andromeda galaxy offers players next.